The Sacramento Bee published an important special opinion article on Jan. 25, 2017, titled State must fund valuable research on climate and energy. To convert to renewable energy, the authors assert, we need more research in storage battery technology, breakthroughs in non-carbon transportation fuels, development of efficient carbon capture systems, and much more. They make the case that R&D is essential to our renewable future. With federal funding threatened, how can we fund this vital research? The authors of the editorial, Ann Carlson, a professor of environmental law and faculty co-director of the Emmett Institute on climate Change and the Environment at UCLA, and Dan Farber, professor of environmental law and co-director of the Center for Law, Energy, and Environment at UC Berkeley, lament the likely loss of federal support for NASA and Department of Energy (DOE) climate and clean energy research under the new administration. Actually, the United States has already fallen behind China by $60 billion dollars per year in research in energy innovation, despite setting goals of freeing ourselves from carbon dependence by 2050! Without vigorous research and innovation, we simply can’t reach those necessary goals. The question becomes, how can California continue to fund the research at DOE Lawrence Berkeley National Laboratory and NASA’s Jet Propulsion Laboratory and other institutions where our own researchers are in the midst of critical studies of climate impact, adaptation, and mitigation? Our state is complex, and already climate change is affecting our coast and the snowpack in the Sierra Nevada mountains. We are moving into periods of record drought. We cannot afford to shut off the research that keeps us informed of changes and helps us to act wisely. The authors explore possible funding sources assuming the DOE budget of $4.8 billion and NASA’s climate program are eliminated as has been threatened. They discuss the possibilities of bonds such as the one that funds stem-cell research that was defunded at the national level in the past, revenue from our cap-and-trade program which is part of AB32, an increase in the gasoline tax or vehicle license fees, or even a small surcharge on electricity bills. They suggest that care must be taken to make exemptions for low-income Californians. A final option is a tax on the extraction of oil and natural gas to offset the contribution those products make to climate change. We are still one of the top oil-producing states, after all, and we can place a tax on imported crude as well. The tax will even encourage drivers to drive less! As Governor Brown has said, we have the will in California to continue efforts to curb climate change even if the federal government bows out for now. 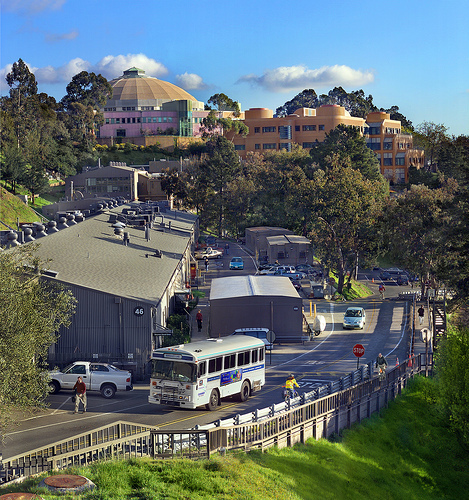 The Lawrence Berkeley National Laboratory. The environmental Energy Technologies division has a yearly budget of $75 million.